You don't have to own a bike to appreciate a great pair of motorcycle boots. Tough, cool, and hard wearing, these boots can be an excellent and versatile addition to just about any wardrobe. Hit the road, the streets, or even the dance floor and make a true style statement in the ultimate pair of leather boots!Motorcycle boots weren't originally designed for fashion, of course. Their true purpose is to protect the wearer's feet; that's why these are some of the hardest-wearing forms of footwear you're likely to find. A good pair of boots should last you years, and the older they get, the better they'll look. Made from tough leather, the boots may also have metal or plastic panels in order to provide maximum protection for the feet, legs and ankles. Heels are low and square, to allow you to maneuver the foot correctly. Ankle-length boots don't offer quite as much protection as their longer counterparts, but their shorter leg does make them much more flexible and easier to wear. Great for shorter trips, or beginner bikers, the ankles are no higher than 7". 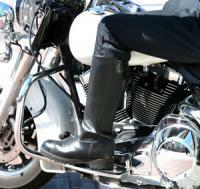 As the name suggests, tall biker boots have a much longer leg, normally between 9 and 11 inches. Many boots have a "harness" attachment around the ankle of the boot. You'll sometimes see this style referred to as the Harness Boot. Because of the added protection afforded by the long leg, these are the boots of choice for bikers on long road trips. With a steel toecap designed to protect your feet from falling objects, these are the toughest type of motorcycle boots around! Within these three basic categories, you'll find numerous different styles of boots. Many bootmakers now offer a waterproof boot, to make sure that your feet are fit for any weather conditions you find on the road. Although black is still the most popular color, by shopping around it's possible to find a variety of different colors and designs. If you've never worn motorcycle boots before, they can take a little bit of getting used to. For men, these may be the first knee-high boots you've ever worn, and you'll want to walk around in them for a while before hitting the road in order to get used to them. Your boots should fit snugly, neither too tight nor too loose. When riding, it's very important that your boots don't feel loose. If the heel appears to slip off when you walk, you may need to go down a size for a tighter fit. If you're new to biking, it could be a good idea to take a more experienced rider with you when you're choosing your first pair of boots. They'll be able to advise you on fit and help you choose the right style of boot for the type of riding you'll be doing. 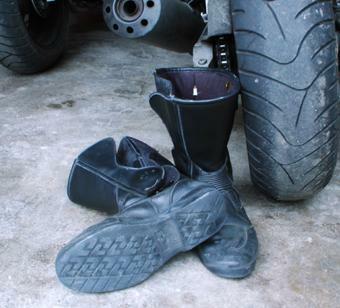 Because motorcycle boots are designed for function rather than fashion, it's a good idea to buy your boots from a specialist store dealing in motorbike clothing. Beware of buying from footwear stores selling boots in the motorcycle style. These are designed purely for fashion, and may not offer the same degree of protection as a pair of genuine motorcycle boots.